Aidan de la Mare, who lives on the Isle of Wright, England, has sent some pictures of his buildings. 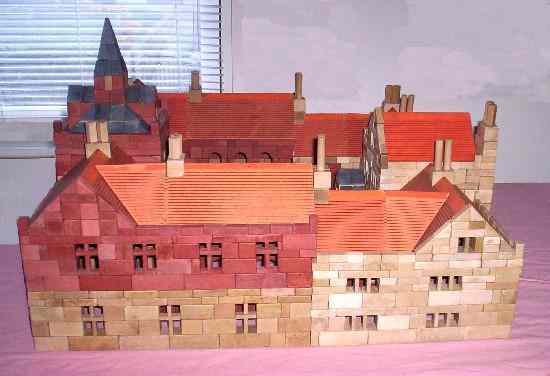 They are a mix of Anchor and Lott's blocks; the roofs are almost all constructed using Lott's cardboard. The picture on the left is about 50-50 Anchor and Lott's. Aiden calls it an "institution". There are a lot of pictures of several buildings on the builder's page. I broke my right shoulder on Thursday, October 28th. X-rays do not look good; an MRI is next. Will know more then, but expect a delay in the English language edition of MLB 2010-4. I wiped out on my Vespa moped. Yes, I had a helmet on. For the month of November, 2010.